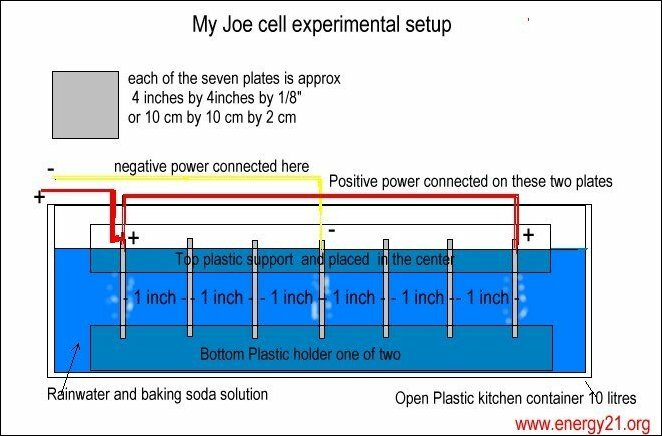 After having the information at my web sites about the Joe Cell and it's claim to be a free energy device. I have been finally able to get time to check some of the details out for myself although I have a long way to go to fit and get one working in a car as yet. But what I have done so far seems to check out with what I have learnt from the original source of this material. Apart from the solar panel everything is relatively cheap and this could be put together to try it out for your self for less than $40 Australian. and the cutting board that I made the metal supports from at about $6.00 and some clips at $4.00 and some insulated copper wire from the junk box. Not having a decent power supply I used a somewhat lesser source of power namely a BP solar panel module that claims 30 watts 17 volts at 2.5 amps. The seven stainless plates were some that I got last year from a wine tank maker and were cut using a normal cutting wheel and I have had them stored in the dark in a vinegar solution for over a year now. They are mounted on some cheap cutting board PVC and grooves have been cut in the plastic support each to allow a tight fit when the stainless plates are pressed into it. The plates are mounted one inch apart from one another althought other harmonic values could be applied here. No additional fasteners were used to hold all the plates in place. 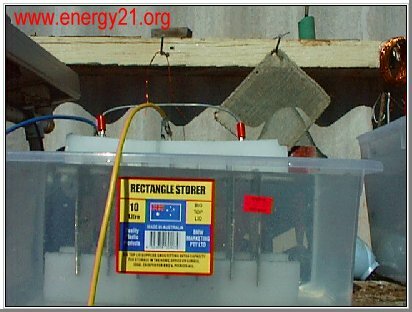 The whole unit was placed into a ten litre plastic kitchen container filled with approximately 8.5 to 9 litres of rainwater water to which has been added 1/4 cup of cooking soda (calcium carbonate). 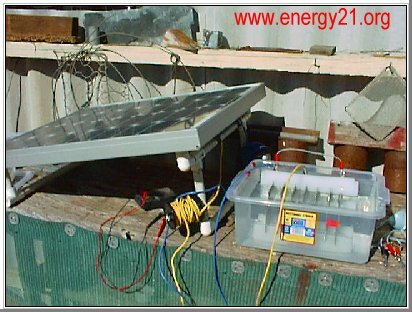 A negative lead from the solar panel was clipped on top of the centre metal plate and the positive lead were made likewise to be in contact with both the outer unit plates at each end. 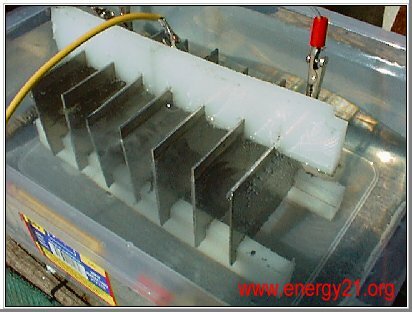 On doing so bubbles were noticed to issue from the two outer metal plates and a much stronger discharge from the centre plate as would be expected in normal electrolysis. The middle plate and the outer plate gas released seem to be coming to the surface and then disappearing into the air around it. After some time later bubbles were also see coming from the other four neutral plates to which no electrical contract was seemingly or knowingly made. The bubbles on these plates seemed only to be coming from those neutral plates and not coming via the other plates connected within the electrical circuit.. I also noticed some bubbles gathering on the plastic inner surface of the water container as well although no gas trail seem to be taking them there. Other bubbles were also seen to attached to all metal plates and all these bubbles seemed not to want to leave the plates and all plastic surfaces even though I shook the outer container several times to try to shake them loose. The only way to remove the bubbles was take the entire unit from the plastic container. I then put the unit into a smaller plastic container but it did not work as well this may be due to sunlight levels effecting the efficiency of the solar panel in the later autumn afternoon. Up to now I have not noticed large bubbles forming but this could be due to the low power levels I was using and the wind blowing over my experimental set up at the time. I did however notice bubbles were still coming from the plates when the power had been disconnected for a short time and most of the bubbles also remained attached under the water level at the same time. From my limited experiment I am convinced that there's something unusual happening here but not sure what. If you have not done I suggest you check out the full details about the Joecell at.